Subject: Anyone has views on a 3P game yet? Fields of Arle has always been a game I've been interested in, but never played nor purchased as it was only 2P. Now with the 3P ability my interest is renewed, though I haven't seen anyone's opinions on how well a 3P game plays yet. Can anyone share their experiences? Thanks! 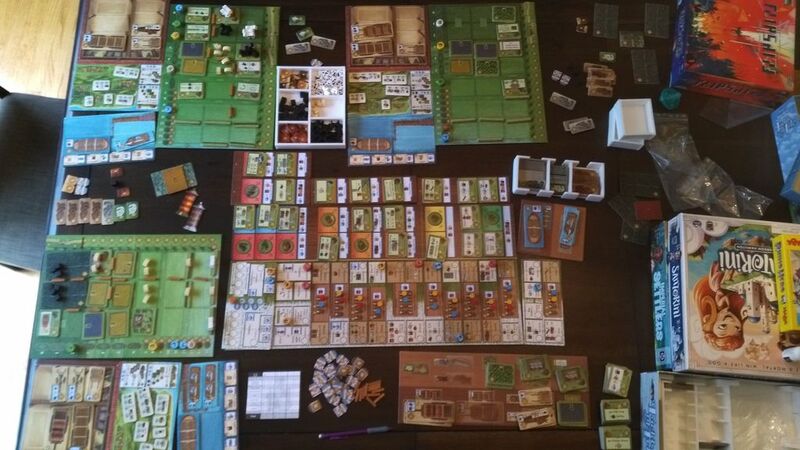 Fields of Arle (...) was only 2P. IMO, the 3P game is good. Only 7 rounds but the quickstart + tea mechanics compensate for the fewer total actions. With the 3 imitate spaces and new actions you never feel too constrained for choices. You are more likely to have a building you were after taken by an opponent but there are more buildings available so this isn't a huge issue. We didn't find downtime to be a huge issue and the new rules are mostly ibuitive but the game will still probably take a little longer than a 2P game with the expansion. The only drawbacks for us are that the table space requirements are big (3.5' * 4') and setup is even more of a chore than the base game or base+exp with 2p. Here's a blurry photo showing the end of our 3p game with lots of suboptimal decision-making (e.g., one of us forgot the aninal scoring rules). Tried the 3p game last night and it was great. I was also a bit worried that 7 rounds would be too few to get some real action going, but it worked really well actually. The quickstart was very smart and I totally loved the tea bonuses. The table space needed is insane and the huge number of available buildings and actions felt overwhelming, but mostly in a good way. Agreed. We also had one new player, so it was especially overwhelming for her. I found the new additions mostly intuitive (didn't care for the Ovens exception, and we found ourselves unsure at times on how/why vehicles ≠ boats). The accelerated start was really nice, something I'd want to port over to 2p games. And the overall pace was comparable to the normal 2p game: 7 rounds x 4 actions x 3 players = 84, vs 9r x 4a x 2p = 72 (but you skip 2 inventorying phases, which brings them just a little closer to equal).